The level of gun violence in Chicago, which has caused shock waves nationally, is continuing with eight people having been shot in the nation’s third largest city in a 24-hour period that ended Friday morning, including one that ended with the death of a 15-year-old boy. Chicago police said that the teenager, Patrick Sykes, was shot several times early Thursday afternoon. They said that witnesses offered conflicting versions of what occurred, with the shooters having been either on bicycles or on foot. Two people were taken into custody for questioning, but they were released without any charges being filed, police said. The 24-hour period of gun violence also included the shooting of an 18-year-old man, three women and several others. The high level of violence in the month of May came shortly after the Chicago Police Department announced that crime in the city fell 8 percent in the first quarter of 2013, compared with the same period last year, and 15 percent from the same period of 2011. 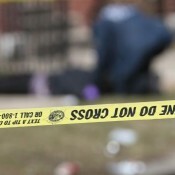 Post Continues: Gun Violence Rocks Chicago as 8 are Shot in One Day | News | BET.